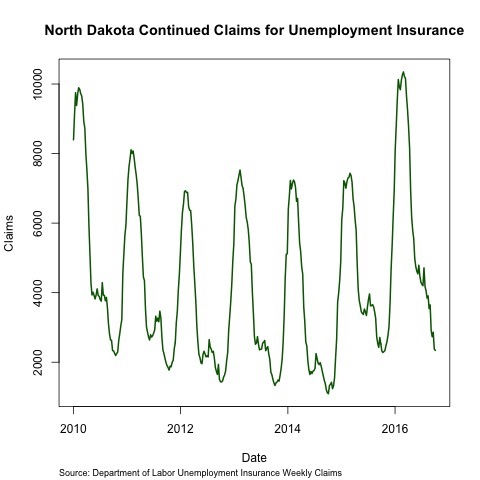 Along with the initial claims we can look at the continuing claims for unemployment insurance from the same source, and I think it better displays the unemployment situation in North Dakota than the initial claims. There are still the issues with seasonality in the data, but the continuing claims into 2016 go significantly higher than prior seasonal peaks, though they do still decline in a similar fashion, remaining a bit higher than before. Overall I think this a good depiction of what was going on towards the end of last year and the beginning of this year.